With the sunshine and blue skies, Florida is a great place to live most of the year. But there are times when homeowners might be a little nervous because a hurricane is moving through the area. If you own a home in Bradenton, FL or the surrounding areas, it is essential to take measures to protect your home during the storm. Here at Armored Dade Windows & Shutters, we offer hurricane impact resistant windows and hurricane shutters that can effectively protect your home. We provide the necessary tools to prevent damage when a hurricane comes. The strong winds and dangerous conditions during a big storm could potentially damage your home. There are a few things that can maintain the structural integrity of the building to prevent serious harm. Windows are more than just decorative panes of glass. They are essential to the structural integrity of the building. If a window breaks, it could be the trigger that creates a weak point where the high windows can bring your home down to the ground. Windows keep your home sealed and it is important to keep this seal in place to avoid serious damage. If the high-speed winds come into the home, the inside/outside air pressure will change, which could cause the roof to come off the building. If you talk to any engineer or building specialist, they will agree that losing one or more windows in a storm starts the domino effect that could bring down the rest of the house. It is more than just broken glass if the entire home is damaged! Instead of taking the risk of serious damage, choose high-quality windows and shutters that will hold up in the high winds. These products resist impact and keep your home sealed, even when the winds are blowing outside. Even though these windows are designed to resist impact in a hurricane, they offer benefits throughout the year. 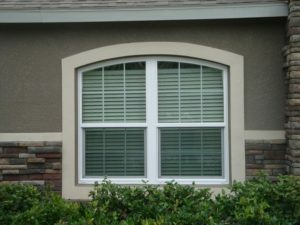 By installing high-quality windows in your Bradenton, FL home, you will improve the energy efficiency of the property. The glass technology that is available offers the benefits of comfort in the home and decreased energy usage. By improving the insulation of the windows, you can seal your home to manage the temperature inside. When energy usage decreases, you will see a drop in your utility bills. No one minds saving money each month and you can do that with highly efficient windows. Another option to consider is to have storm shutters installed to protect non-impact windows. Storm shutters can be designed in several ways, depending on your preferences and the style of your home. Some homeowners like to have accordion shutters, which are convenient to use both inside and outside. This design folds up like an accordion when the shutters are open. Roll down shutters offer a versatile solution that is stored at the top of the window. You can choose roll down shutters that need to be manually opened and closed. You might also want to consider the convenience of electric controls so you don’t have to make hands-on adjustments when the shutters need to be moved. If you have a large opening, such as lanais, then a storm catcher might be the right solution. This product is an abatement system for hurricane windows, deflecting approximately 97% of the rain and wind. The most economical solution is to choose storm panels, which have minimal impact on the architecture of the property. These panels can be designed to fit your windows and can be put into place before a storm. You can protect your home without breaking the bank. Don’t wait until a storm is in the forecast before you take action to keep your Bradenton, FL home safe. By installing storm shutters and hurricane impact resistant windows and doors, you are prepared for bad weather. Once the storm is predicted in the forecast, there isn’t enough time to install the products you need to protect your home. Here at Armored Dade Windows & Shutters, we offer all of the products you need. In addition to the features and styles that are mentioned above, we also have other products such as hurricane fabric and other shutter designs. Our goal is to help you find the products that will best meet your preferences while protecting your home. Are you interested in learning more about hurricane impact resistant windows and doors? Contact our team at Armored Dade Windows & Shutters for more information. We have a showroom that you can visit at 8112 Cortez Rd W Bradenton, FL 34210. Feel free to call anytime to schedule a consultation with one of our experts: (941) 798-9010.